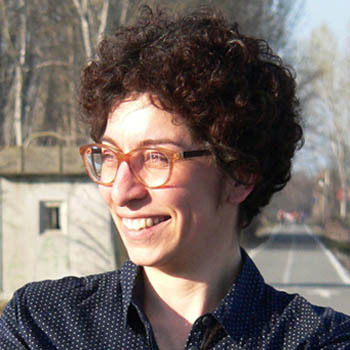 Emanuela Giudice is a Turin based educator. She graduated in architecture and she holds a PhD at the Polytechnic of Turin with the thesis Lectures. Tools, methods and compositive applications in architecture between Whites and Grays. She focuses her research on the radical and post modern languages and their relationship with architecture and design. She collaborated with the Polytechnic of Turin and she has been lecturer at SIJU (Saint John International University) in architecture theory and criticism courses. She developed cultural and education projects related to architectural topics and she has been a broadcaster for the radio program “Les Bijoux Indiscrets”. Among her publications Paradossi dell’architettura. Intorno all’Eupalinos di Paul Valéry (Celid, Torino, 2011), “Gufram. Le matricole di massa in una fabbrica di design”, in M. Gausa (ed. ), Rebel Matters. Radical Patterns, forthcoming. She involved both in academic research and in teaching at universities.